iCUP instant drug tests are all-in-one drug tests that do all the testing or screening for you that come with or without Adulteration. The instant drug test results are ready in just seconds. Because of the technology design behind the iCup manufactured by Alere instant drug screening can even be photocopied. 3 - 13 drug panel configurations are available. CLIA waived configurations are even available. Drug testing is becoming more popular in the home and in the work place. The iCup is a zero-exposure urine drug screen that tests for up to 13 drugs in 1 device. This drug screen is fast and reliable, and the results can be photocopied for easy result recording. The iCup A.D. is a zero-exposure urine drug screen that tests for up to 12 drugs at once. With built-in validity screening and results that can be photocopied, the iCup A.D. is one of the best drug screening options on the market today. There are many different options for the type of screening needed. 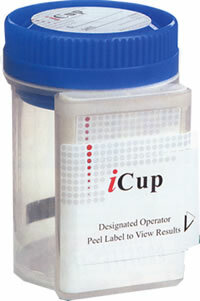 To view all of the iCup Drug Screening Options, visit our online store.